About 100 international researchers from Europe, the Middle East, Australia, and the U.S., among other places, gathered to present cutting-edge research and discuss unresolved questions for both young children and older individuals with the fragile X premutation. The meeting was divided into sessions about clinical, molecular, animal models, screening and diagnosis, and features common to individuals with the premutation. 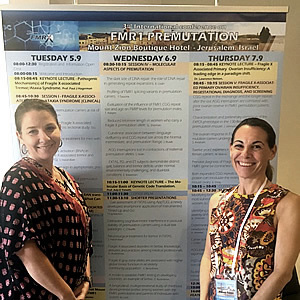 Although many sessions focused on the two known FMR1 premutation disorders, fragile X-associated tremor-ataxia syndrome (FXTAS) and fragile X-associated primary ovarian insufficiency (FXPOI), others covered topics that related to carriers more broadly. Drs. Raspa and Wheeler presented about features common to premutation carriers. Dr. Raspa gave a talk about sensory difficulties in children with the FMR1 premutation. One key finding from this study was that children with an FMR1 premutation display mild issues with responding to auditory information (e.g., background sounds, loud noises) and tactile sensitives (e.g., bothered by scratchy clothing, resist hugging), and moderate challenges with eating and feeding behaviors (e.g., avoids certain types of food). Dr. Wheeler presented about stress, coping, and mindfulness in women with an FMR1 premutation. Results highlighted in her talk showed that mindful parenting and acceptance may increase the ability to cope in the face of stressful parenting. In a second talk, Dr. Wheeler presented about behavioral traits in infants with a premutation, reporting that overall behavioral patterns were similar, but milder, for carrier infants when compared with infants who had the full mutation. Other meeting sessions were devoted to sharing research about molecular pathways that may be associated with the FMR1 premutation, markers and early symptoms of FXTAS, and the way that specific gene mutations, called AGG interruptions, may affect the symptoms that carriers have. Screening and diagnosis sessions included talks on both prenatal and postnatal screening studies. Other sessions focused on measuring and treating clinical symptoms of individuals with an FMR1 premutation. The range of conference sessions showed that researchers are examining many aspects of how carriers of fragile X are affected, but also how these individuals find strength and resilience to overcome obstacles associated with their condition. Drs. Raspa and Wheeler were excited to be part of this important meeting and to contribute to ground-breaking research that could improve the lives of Our Fragile X World families. What questions do you have about the fragile x premutation? What do you hope researchers will learn between now and the next FMR1 premutation meeting? Please consider sharing your story with us. We hope to hear from you!